That’s the Whidbey Island Half in a nutshell… but really, it’s so much more than that. I had the pleasure of living in Oak Harbor, Whidbey’s largest city, when I was stationed at NAS Whidbey Island in 1999 and 2000. Oak Harbor is a small city with a small-town feel. Despite the hordes of Navy folks who come and go like the seasons, there are many who “homestead” and stick around for years and years. I was not fortunate to be one of those, though given the opportunity I might have made a go at it. 🙂 The day I left, I remember feeling quite despondent and I have missed the island ever since. The course starts in the middle of town, auspiciously enough with an UPHILL start. That’s when I knew this was going to be a challenge, especially considering it was about 46 degrees with overcast, heavy skies that threatened rain and some seriously blustery winds. I went into the race with the goal of 2:15 or better, taking into account the hills I thought I expected. Well, I was about to be surprised. Uphill, downhill, rolling hills, and all with this infernal WIND that kept blowing from all directions. It wasn’t like a headwind going one way and a tailwind coming back. It blew from side to side and all around. My hat almost flew away at one point, and at another, the tailwind was so fierce I kicked myself in the ankle and almost took a header. On more than one occasion I had to hang onto my hat to make sure it didn’t blow off again and also ensure my bib didn’t come tearing off the safety pins holding it to my shirt. The gusts were at least rolling through at 30+ mph. Thankfully it didn’t rain on top of that! The first half of the course was *mostly* flat, with a few rollers at the beginning. Miles 5-6 were through downtown, and then we headed south into the Scenic Heights area – yes, Heights. It’s not a metaphor. We hit mile 6 and up and up and up we went. For about half a mile. With the strongest headwind I have ever encountered. Normally, my plan is to walk steep hills, but this time I just kept running, albeit at a slower pace. FINALLY we made it to the top and it was flat for a short time, then a slight downhill. I wanted to be elated about this until I thought about how it would be UPHILL on the way back. We passed houses, farmlands, and even a field with three horses – one black, one brown, and one tan and white – who were running around in a circle as if they were participating in their own track event. I grinned while watching them (until the wind threatened to whip my hat off my head again)…then they just stopped dead in their tracks, watching us run by down the road. After a moment or two, they started up again, running around in a circle. We turned a corner, and guess what? Another hill! And more headwind! We were at about mile 8 by this point and I was starting to get quite tired of hills. I reminded myself that the San Francisco Marathon has more hills and buckled back down into myself to gut it out. Another gentle downhill, some more up, a banked curve (no runner likes those) and soon we were at the turnaround point, roughly the 15K mark. We headed back UP the hill and the wind started again. Would we never get any relief from this infernal wind??? After about a mile of that, there was a brief respite and then there was much rejoicing – a giant downhill portion. Needless to say, Jen likes downhills. A LOT. Sooooo, I took off running like the hounds of hell were behind me. It was glorious. We hit a flat patch, a slight uphill, then, at long last, that big half-mile hill I hated so much at the beginning? We were baaaaack! And it was downhill! I took off again, clocking myself at around 7:40/mile for a good portion of it. I started making up the seconds I had lost at the beginning. 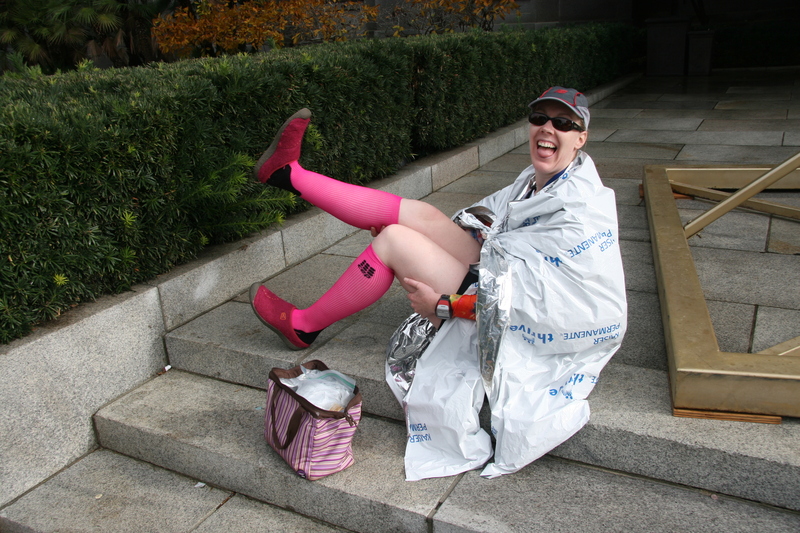 It was so cold that I couldn’t feel my fingers – I quickly got my medal and my clothes bag (thankfully I had thought to pack my chocolate milk!!!) and threw on every bit of clothing in my bag. I was shivering so badly I could barely get my clothes on. I then waited for the shuttle and got back to my car as quickly as I could. I didn’t stick around for the post-race food or anything. I just wanted to be warm. 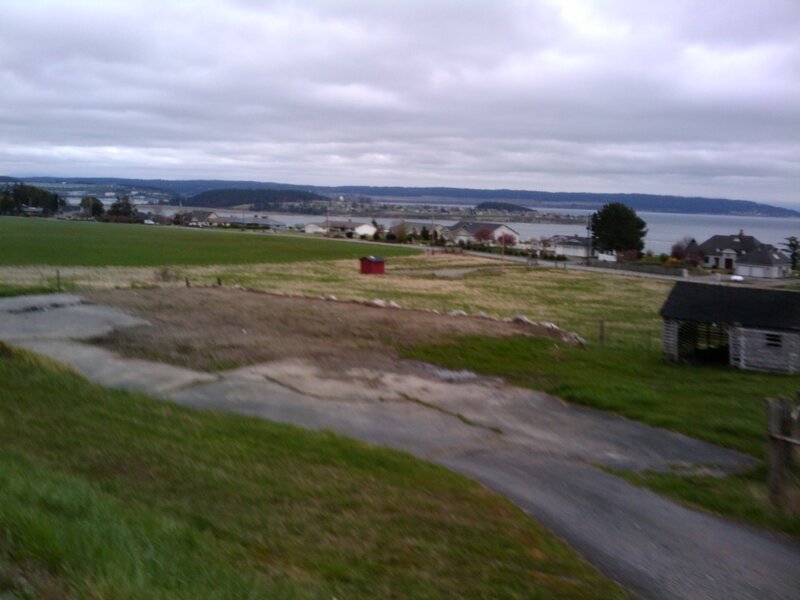 Oak Harbor as seen from between miles 10-11. Win a FREE entry to the SF Marathon! All you have to do is check out Ambassador Aron’s blog here to learn more!!! P.S. Today’s her birthday, so give her a shout! This was my first race of 2011 AND my first race post-marathon 9 weeks before. At the beginning of the year, I started incorporating strength training, Pilates, and yoga into my routine as well as making the transition to a more clean diet. I initially went to the gym for strength training but became hooked on Jillian Michaels’ DVDs (30-Day Shred and No More Trouble Zones, specifically) and the 10-Minute Solution: Pilates Perfect Body workout DVDs. I dropped approximately 10-13 lbs, probably from no longer eating sweets and other “bad for you” foods. In addition to that, I transitioned to running 4 days a week, averaging 20-22 miles per week. This is more than I have run in the past. I was also doing a tempo run each week at around 5K race pace. I started to notice something amazing! My longer runs were getting….faster! 🙂 I still use the run/walk method in training, but the run portions were much faster and my overall average pace was increasing as well. I went into this race feeling optimistic about a 2:10 finish, only partially hoping for a PR. The weather couldn’t have been better: low 50s and foggy, as we were right on the beach. This was one of the most well-organized races I’ve ever run, and, as this was my 68th race, I’ve seen a few. 🙂 We were in wave starts and my wave started right around 8:00am. The course started out along Pacific Coast Highway and was flat through miles 1-3. I ran at a conservative 9:45/mile pace, trying to keep my enthusiasm to a minimum and not push too hard. 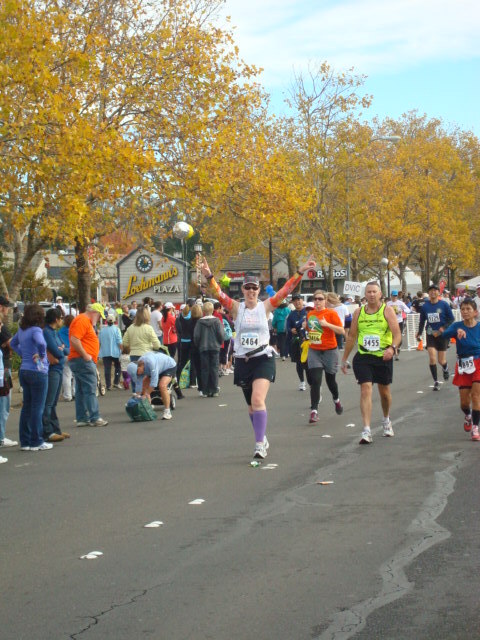 I had just finished the two-day Road Runners Club of America coaching certification course and was remembering all the tips I had learned as we developed a race plan for a fictitious client. Start out slow, don’t weave in and out of other runners, run the tangents (i.e. cut the corners), stay hydrated. At mile 3, we took a turn and headed up a slight incline into a residential neighborhood. At this point we crossed the first timing mat: my time was 29:15 (9:45). I maintained my effort up the hill, and just shy of mile 4 I passed one of my fellow WOW Team members, saying hello to her as I went by. I took my first Gu around mile 5.5, as I had almost forgotten about it. 🙂 We did a kind of dog-leg loop around the neighborhood and through a park, downhill back to the PCH, where we turned right again and kept heading north along the waterfront. Miles 6-8 were straight north along the highway, and I felt really strong. I didn’t feel like I was working too hard, so I just went with it. We passed several aid stations (roughly every mile). I walked at a brisk pace through each aid station, roughly about 20-30 seconds. 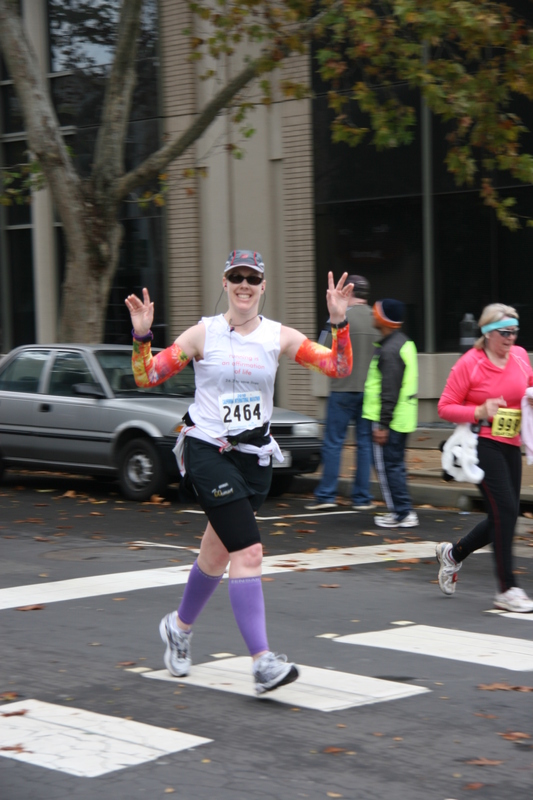 At around mile 7.5, I saw my other WOW Team teammate on the return leg and called to her with a wave. At mile 8.1, we took a hairpin curve and headed back south down PCH. I crossed the second timing mat at mile 8.2 in 1:17:13, a 9:25/mile pace. At this point I decided to take it a little more conservatively so I wouldn’t blow out before the finish. I could see the 2:10 pace group ahead of me, so I decided to run with them for a few minutes to keep a slower pace. (They started a wave or two before me, so you can see I was reeling them in, so to speak. I started behind the 2:14 group.) I ended up with them for about 0.6 miles and decided to just keep going because they were a bit inconsistent with the pacing. I pulled ahead of them and slowed at an aid station, where they caught up to me… but I left them behind again and actually started to draw close to the 2:06 pacers (I never saw 2:08). By mile 10, I knew I would PR but I didn’t know how close I would be. My eventual goal is to break 2 hours – I think it is possible with more optimized training. 20-25 miles a week is good, but with more speedwork, some hill training, and longer long runs I think it’ll happen! There’s no feeling like a shiny new PR! Quick note to share that I raced a PR at the Surf City USA Half Marathon! I’ll write a full race report soon, but had to share the good news! New PR: 2:04:24 (9:30/mile)! It was a fantastic race! 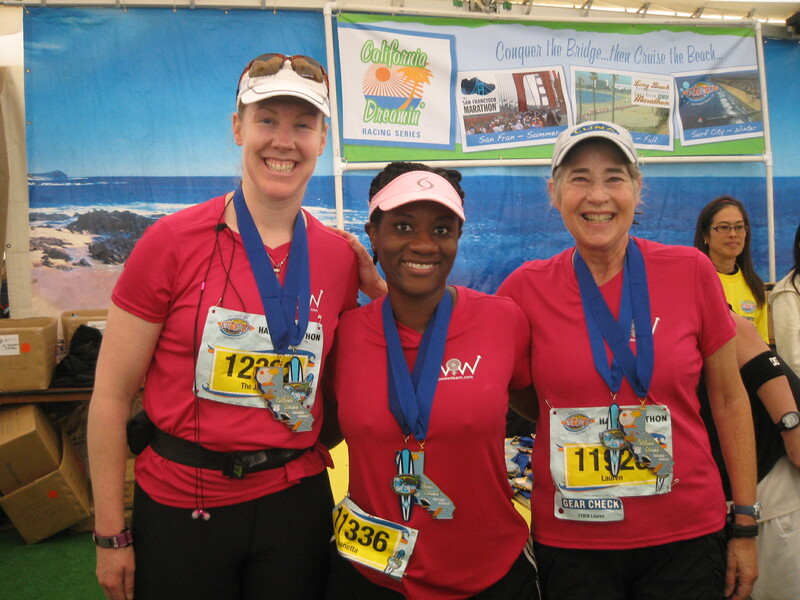 Surf City USA Half Marathon, this Sunday, Feb. 6! My first race post-marathon! Well, it’s done. I have done it. I have run a marathon!!!! What an amazing experience. I got on the bus at my hotel and it took us to Folsom. We arrived at the race around 5:45 with nothing but time. One of the best things about CIM is that you can stay on your heated bus until 15 minutes before race time. The weather was most kind to us – the rain stopped at around 4:30am and the sun came out for most of the day! 🙂 Of course we all performed the usual pre-race ablutions: waiting in line for the porta-potties (which, no kidding, stretched down the road as far as the eye could see. AMAZING. ), dropping off sweat bags to the trucks that would carry them back to the start, drinking water, eating bananas, etc. I did all of that and still had time to relax on the bus. At 6:45, I made my way to the start (right up the street) and found my pace leader. I decided to run with the Clif Bar Pace Team, specifically the 4:45 pace group. Before I knew it, the gun went off and the race began! We went out a little faster than I expected, probably because the first mile was downhill. Miles 1-4 flew by; I somehow missed the table with water at both aid stations, so I drank the Gatorade in my hydration belt and waited for the next aid station. When I got there, I dumped my 8 oz bottle of Gatorade and had them fill it with water, then drank two cups back-to-back. I felt much improved at that point. Some tropical punch Clif Shot Bloks and I was on my way. Miles 5-8: Also very fast. Didn’t really notice the time flying by. We passed Relay Exchange #1 at about the 10K mark; it was exciting to see the ladies from the WOW Team handing off at the exchange points. All told, I ended up seeing four of them on the course. It’s always nice to see friendly faces! At about mile 8, I went internal – headphones went in and I started to buckle down. From miles 10-14, it’s the section called the San Juan Hills, and while everyone said they were no big deal compared to San Francisco, I still felt it. We were also going WAY faster than our predicted pace of 10:51/mile – those were actually my four fastest miles of the whole race, so I tired out quickly. We passed Relay Exchange #2 at the half marathon point – where I saw Jenni, who cheered and rang her cowbell medal for me – and by mile 14, I was done with the pace group, it was just too fast. I started my 9:00/run and 1:00/walk interval. Mile 15 was a struggle for me and I ended up having to stop at a porta-pottie because my stomach was bothering me. No major GI problems, thank goodness, but I did lose about 4 minutes waiting in line. (Bummer.) After the stop, I felt better, and miles 16-20 were pretty good. I found myself running pretty fast on the run intervals (10:30-10:45) and I walked as fast as I could on the other. I still felt pretty good at this point, I think it was all the Shot Bloks, gel, Gatorade, and water I was consuming. My feet were a little sore and my legs were definitely tired, but I didn’t ever feel “the wall” looming over me. Fueling is essential!!! Miles 21-25 were through flat, scenic, residential areas. There were a lot of beautiful older homes and even an authentic German Christmas market along the way. The crowd support was fantastic! People were ringing cowbells, yelling, and playing music. I made the final turn onto L Street and I knew I was going to make it – I got a little choked up. I met up with Jenni and the hubs after the race, changed into my wonderful new CEP compression socks (seriously, I highly recommend them) and hobbled back to the hotel. After an ice bath, shower, and bed rest, the hubstar and I had a lovely dinner at Pyramid Alehouse. I’m beat, but I feel so amazing. I thought about Steve, and my friend C’s stepfather, and all the other suicide angels and those who have been left behind. It was moving and inspiring to run for such a worthy cause. As of now I have raised over $1,100!!! Thank you again for all the support. November: Month in Review… and 2 days to go! 93.1 miles run in November. Yep, it’s been taper time!! Two days and a wake-up until the marathon!!!!! If you are interested in tracking me online via live results, you can do so here: California International Marathon LIVE Results! My bib # is 2464. We start at 7:00am Pacific Time on Sunday. Splits are recorded at miles 5.9, 13.1, 20, and the finish! In other news, I successfully raised $1,120 for the American Foundation for Suicide Prevention! Now all that remains is to get to Sacramento safely tomorrow, enjoy the expo, fuel wisely, hydrate, sleep, and RUN 26.2 MILES FOR THE FIRST TIME. Thanks to you all for the invaluable support. 🙂 I’ll be thinking of you every step of the way! Today was the Run Wild For A Child 10K, and I ran it plus 1.8 miles after – total for the week: 16 miles. All that’s left are two 2-mile runs, and the early mornings, late nights, long runs, hot weather, cold weather, rain, wind, aches, pains, doubts, fears, and the last 24 weeks will come down to ONE epic run. Keep your fingers crossed that the weather cooperates!!! The latest intel is that there’s a 60% chance of showers, but that has been known to change! 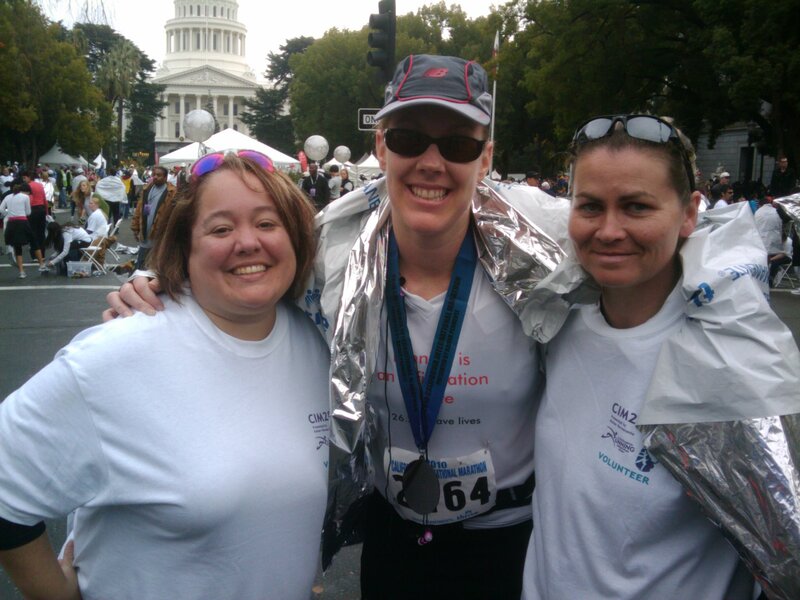 Only 15 days to go… and I have reached my $1,000 fundraising goal! However, I am taking donations through 12/10!